Please read the installation notes that pertain to your system as well as the general notes below. The supported platforms are listed with quicklinks on the right of this page. Important Note for 9.3.1: A current unresolved issue with a Java function on Windows affecting PDFs may mean that Windows users may wish to hold off on installing unti the fix is announced. LDAP functions are also still on the workbench. 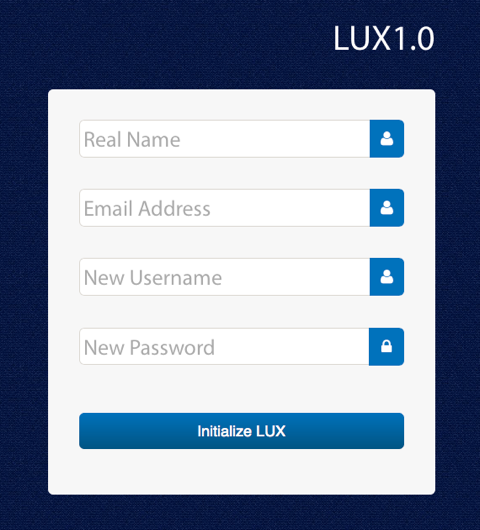 Security Note for 9.3.1: All versions of LUX shipped with versions prior to 9.3.1-4 are affected by a security issue with the LUX interface. Although no cases of affected systems have been reported, we strongly recommend all users either update to 9.3.1-4, update their copy of lux.lassoapp to the version shipped with 9.3.1-4, or restrict access to port 8090. IMPORTANT! Before you install/upgrade, check the requirements below. This release will install a module for Apache 2.2 on OS X 10.7 - 10.9 and Apache 2.4 on OS X 10.10 and later. Upgraded versions of OS X can re-run the installer to re-install the module if necessary. 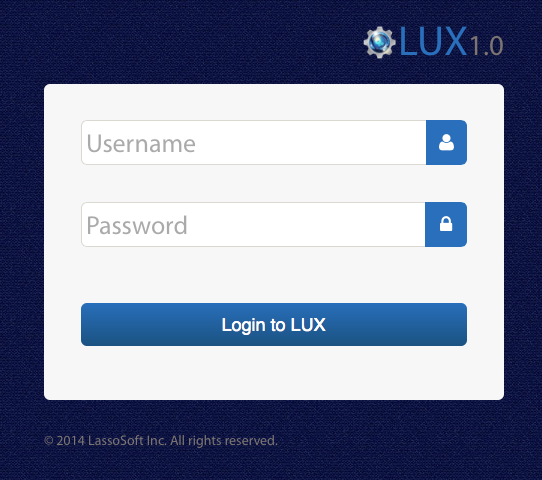 ​After running the installer, open http://localhost:8090/lasso9/lux in a browser to complete the installation. 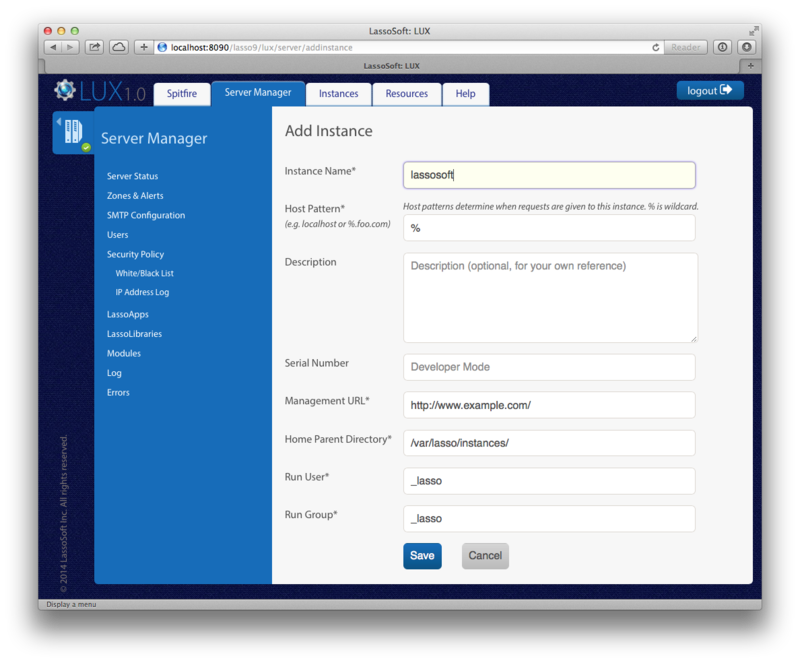 After running the installer, open http://server-domain.name:8090/lasso9/lux in a browser to complete the installation. sudo add-apt-repository "deb http://debianrepo.lassosoft.com/ legacy main"
Lasso 9.3 is a significant evolution of the Lasso product line, and as such there are a number of changes included from the ground up, and so we recommend thorough testing before deploying; LassoSoft cannot assume responsibility for issues arising from installations of beta or release candidate software. NOTE: the original admin URLs from older versions of Lasso 9 (9.1/9.2) are no longer valid and should automatically redirect to the pattern above. Please make sure this port requirement is noted and permitted in your enviroment. The above screenshot is a "clean" install and as such has no instances. Your CPU and Memory graphs may not display immediately, as they require a few minutes of data to be able to reflect actual usage. Adding an instance is done by clicking the "Add New Instance" button. The Add Instance process under 9.3 is almost the same as under the previous Lasso 9.x "Instance Manager". NOTE: you must enter a valid and accessible "Management URL" for the Add Instance to be successful. Do not use spaces or special characters. See the screenshot below for an example of what this looks like. Spitfire is Lasso 9.3's dedicated web server, and runs full time to manage Lasso's UX (LUX) and associated processes. Port 8090 is reserved for the admin UX. Spitfire can also be configured to run as a lightweight replacement for Apache or IIS. 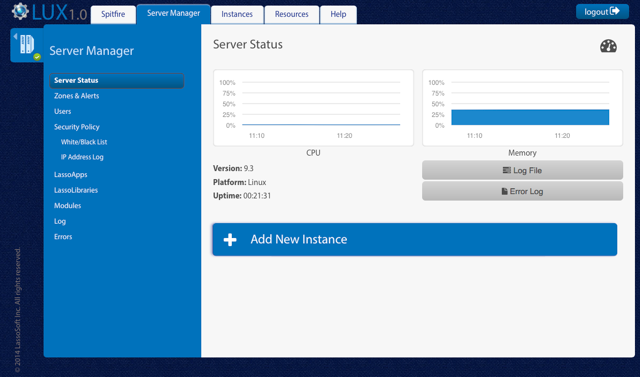 Instances run as "sandboxes", and can be configured to respond to specific ports and hosts. First, turn your "normal" webserver such as Apache off. 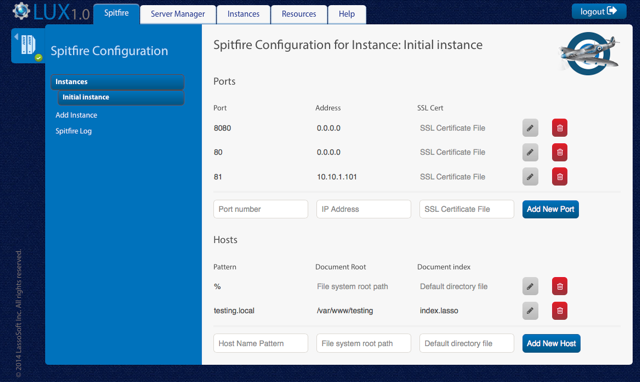 Select the instance you wish to configure Spitfire access to. You will be presented with two types of configuration: ports, and hosts. Ports can be bound to IP addresses and SSL certificate files. * 0.0.0.0 is synonymous to "all IP addresses". In the UI in a later beta you will be able to select "any" or an IP address. Hosts define what hostname the instance will respond to, the document root and default index file. You could, for example, have two instances both responding to port 80 but with different hostnames - exactly like Apache does now. We do encourage a "fallback wildcard" on an instance, otherwise you will receive a "no instance configured for this hostname" error for an unspecified host. You don't need to do anything at all to make Spitfire recognize changes to the configuration. There is a background watcher that will recognize changes and triggers a reload of Spitfire within a few seconds of any config change. LUX has built-in issue submission, directly in the UI. 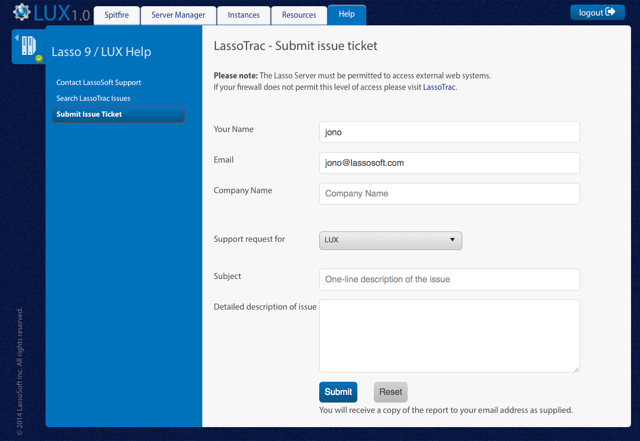 On the "Help" tab, there are currently 3 menu items - "Contact LassoSoft Support", "Search LassoTrac Issues", and "Submit Issue Ticket". If you find what you consider is an issue with 9.3 or LUX, please log it using "Submit Issue Ticket, and select Lasso 9 (core), LUX (admin), or Documentation (not working as documented). NOTE: Lasso 9.3 requires outside net access for the connection to LassoSoft's API's for most of the functionality in the Help tab, as well as for the initial collection & caching of data in the Resources section.